Paige Wolf and her family advocate for change in Philadelphia. I haven't always been an activist. When I was younger, I did the bare minimum. I voted in elections and wrote vaguely political columns for my college newspaper. But I never actually tried to do anything about injustice. Things changed in my late 20s as I discovered more about the world around me. Learning about some of the injustice in our world opened my eyes to a Pandora's box of troubling information, and I became determined to use my voice for as much good as reasonably possible. Now, at 38 years old and as a mother of two in Trump's America, I have had to learn to choose battles, fight wisely, and manage time and efforts in a way that is both practical and powerful. Here are some of the lessons I've learned about how to advocate effectively. Start with a whisper and then slowly amplify to a scream. Though it's easy to blast social media every time we want to protest something, it may not always be necessary or effective when it comes to making change happen. Often, you can make change with a simple direct ask to the person in power – whether that is a supervisor, a principal, a CEO, or even a local elected official. It might surprise you how easy it can be to get a "yes." When that doesn't work, it helps to loop in other influencers and decision-makers who can help apply pressure. I learned about this when, after not receiving timely replies from the Philadelphia School District about environmental health issues in schools, I reached out to local elected officials to help bring attention to my concerns. As time went on without sufficient response, it became time for me to get louder. I started a petition, reached out to local media, and made myself heard. My actions connected me with local advocates doing similar work, so I no longer had to feel like the only voice in the choir. And having partners helped me to get some of the specific answers I was looking for, a first step in moving forward. Choose your time investments wisely. Between working and taking care of our families, most of us feel as if we barely have time to make a dentist's appointment — let alone be the change we want to see in the world. It's important to make calculated time investments and focus on the action items where we feel as if we are really making a difference. If a group, project, or action you are involved with begins to feel futile, fruitless, or frustrating, it's OK to walk away and focus on something else. 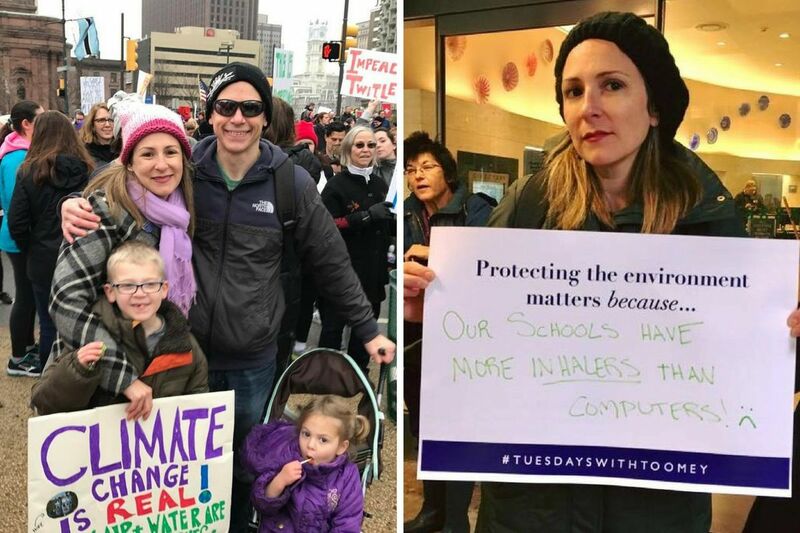 For instance, in the early weeks of the Tuesdays With Toomey movement — when a group of displeased constituents regularly met outside GOP Sen. Pat Toomey's offices to have our voices heard — I was active in attending the protests and helping the team to amplify its message to the media. Over time, though, it became clear that sadly, swaying Toomey's votes was not an achievable goal. I applaud the continued movement, which has become a local leader in continued lobbyist action and political education. However, for me, it was time to reinvest my personal time into other actions, such as joining my local school advisory council, donating time and energy to environmental advocacy groups, and campaigning for progressive candidates. As our lives change and organizations evolve, it's reasonable to want to reinvest your time into a new project and lend your voice to a different cause that feels closer to your heart. Just because you can’t do everything doesn’t mean you should do nothing. With so much happening at once, it can feel terribly overwhelming. Every one of us has been tempted to turn off the television, delete social media, and hide under the covers. But don't underestimate your potential to be a powerful force for change – even if you have only five minutes per day. Choose just one or two causes you feel most passionate about and connect with the organizations doing work in those areas. By following the action items directed by even just a small handful of organizations, you can add to call tallies, increase petition reach, and maybe even tell the personal story that actually changes someone's mind. Paige Wolf is the author of "Spit That Out: The Overly Informed Parents' Guide to Raising Healthy Kids in the Age of Environmental Guilt." She is working on a book about everyday activism. Follow her at www.spitthatoutthebook.com and @paigewolf.